Artist, curator, and gallerist, Sam Lipp’s work floats. Despite his paintings’ use of seemingly clear language and representational images, the exact meanings behind them remain unnervingly difficult to pin down, unendingly unfixed. His paintings are suffuse and textural. They alternate between almost comic hand-scrawled text, crass images with heavy lines, neat print and quiet, even delicate, renderings of bodies. Like the layers of colors that comprise the images—a singular wash from a distance and a riot of shades up close— careful examination only further confuses. The paintings revel in this work of mystification. Seriality, repetition, appropriation, and reproduction abound. Apart from or perhaps more accurately, growing out of his painting practice, Lipp is also co-director of Queer Thoughts, the gallery that he founded in 2012 with fellow artist Luis Miguel Bendaña in a closet in Chicago. The gallery has since grown up (and come out of the closet), and is now located in New York City. DZ: Many of your paintings are on simple foamcore, similar to what you would find at a craft store. SL: The foamcore’s probably the most personal aspect of the work because it reminds of the experience of being creative as a kid. It’s the stuff of school projects. My dad would present my work when I was a kid, even just drawings that I would make. He would take them and have them mounted on foamcore and then they would make gifts for my grandparents. We have some of them in our garage still. With the texture and flimsiness of the foamcore compared to more “typical” painting materials, it seems like decay is intrinsic to it. Exactly. Everything about it is not precious. A lot of the paintings have been kind of wonky. Sometimes the corners warp. Part of the reason I chose to do the pieces on foamcore was to make this crappy, synthetic object that can degrade. But also, using the foamcore is thinking about what material is accessible and what material is not necessarily loaded with art historical weight as a mode of communication, but relates to how people are actually using flat media as a way to communicate in a direct, literal way. Carol, Acrylic and inkjet on canvas, 12w x 18h in. What about the actual painting, do you use traditional brushes? No, I use steel wool as a paintbrush. It’s like sponge painting, like a stamp almost. It always creates different brush stroke and sprays these tiny particles of paint all over. It builds up layers and layers and layers and layers and every layer is a different color. So, the goal visually is that a color could appear as a single color and then when you investigate it further, you realize that it is every color. Where do the images and words you work with come from? 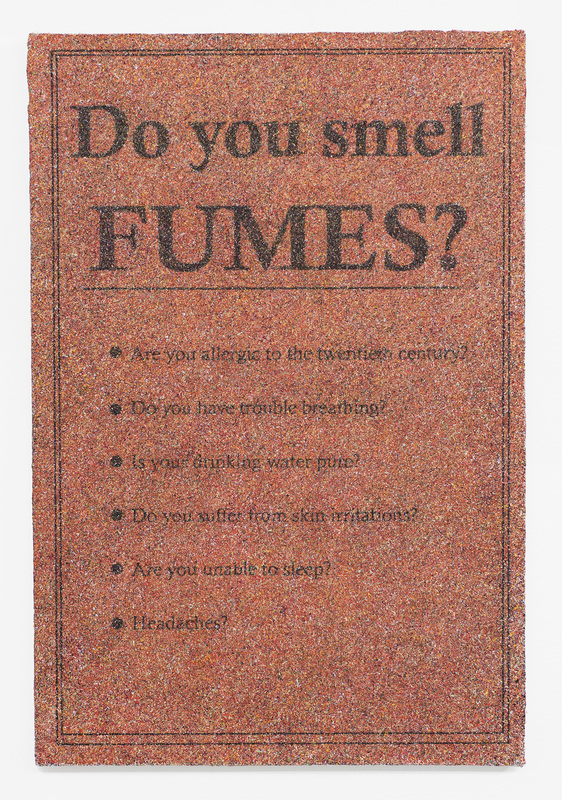 The text on Do You Smell Fumes?, 2016 and Carol, 2016 (partially repeated on other works) is from a flyer that is a prop in the Todd Haynes movie Safe with Julianne Moore. Moore’s character lives in the Valley in the late 80s and starts having these chemical sensitivity attacks and she doesn’t know what is happening. A lot of doctors have different opinions but then they keep testing her and they can’t find anything wrong with her. It becomes this growing thing where she has to leave society and live in a commune compound in the desert in this ceramic cell, and there is kind of this undercurrent theme of AIDS and immunodeficiencies that’s happening. The movie was made in 1995, but it takes place in maybe 1988 or 89. This interest, and even just the idea of smelling fumes, calls upon ideas of purity and impurity, and the attendant political meanings. 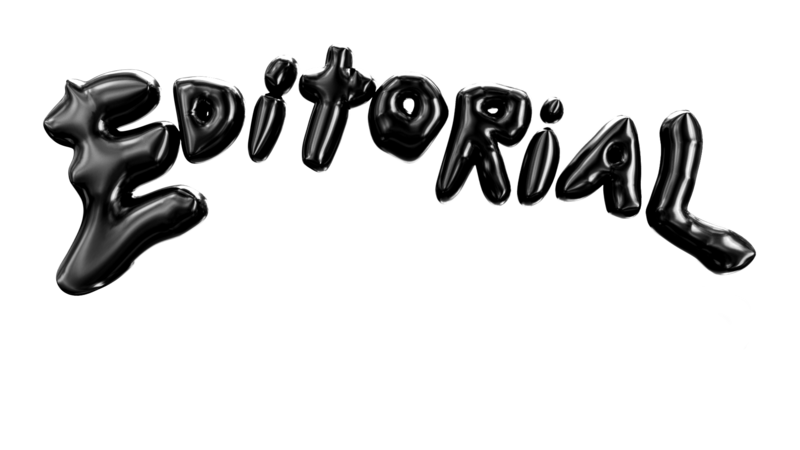 How are you thinking about this kind of purity or contamination in your work? I feel the idea of purity is an unattainable goal or ideal and that functions on this false inside/outside dichotomy. I was interested in purity as a political motivator and how even an idea of purity can sort of negatively motivate us. It can make us self-immolate. Purity can serve something against yourself. There’s also, especially for a viewer who’s never seen the film, a real difficulty to make a singular, clear meaning out of what at first appears to be very clear and straightforward text. I think strategic indeterminacy of meaning can be a political gesture and a way to reroute agency. Just as identity is always shifting and never static. Your paintings often feature images of gay intimacy, such as Sleep, 2016 and Villa, 2015. Where do these images come from? For me, intimacy is not really a concern, it’s more shame and transgression. The image in Villa, 2015 comes from this zine that I found at a thrift store in my hometown when I was 13. I frequented this church mouse thrift store called Community Projects nearly every single day after school. One day, the older women who worked there put out like a display of poetry books that was supposed to be this nice display of “high culture” or something. There was this one book called Dark Roses centered right there and I opened it and it was made by this bizarre gay poet from the 80s and early 90s in San Francisco, Michael Thomas Kelley, and there were all these bizarre, disturbing images of him. Like in his artist’s portrait he’s masturbating. It’s just really dark. This drawing was actually made by another artist, Peter Gonzalez, but Kelley was citing it in this collection of poetry because it had been the supposed cause for banning a Canadian publication, Queer Poets Lives, poems 1973–1978, edited by David Emerson Smith, 11 years before. My mother confiscated the book from me, but then I somehow found it and got it back. I guess I just thought it was funny at that time but it was also this weird thing I was hiding. Then I rediscovered the book when I was in college. This image by Gonzalez really had a resonance for me so I wanted to revisit it. If there’s intimacy here it’s not intimacy in the image, it’s intimacy of and with imagery. Like with the text from Safe, I was transfixed. Yes. Yes. The text and images kept appearing for me in real life and also in my mind. It seems with the materials you choose and the images you appropriate, you are often returning to your youth. These images are like the foamcore, which is in many ways the most personal aspect of my work. My own adolescence is something that I’ve been mining as content because it just holds this resonance for me as this time of keeping things secret and being weirdly very creative and expressive and at the same time secretive and really embarrassed—expressive but totally mortified of the expression. Villa, Acrylic and inkjet on canvas, 12w x 18h in. Would you say your work is confessional? Of course, apart from your own paintings, your other project is as co-owner of the gallery Queer Thoughts. 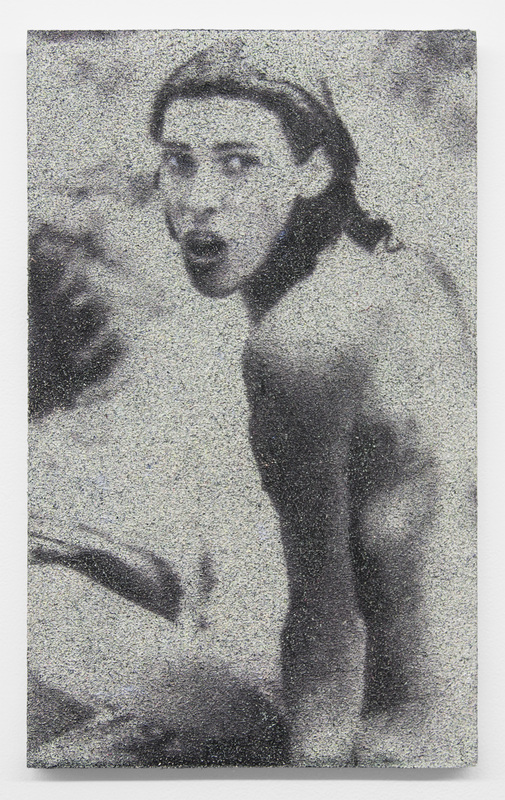 Is there a relation between your work as an artist and your work as a gallerist? I can’t really separate it. Certainly the gallery takes up a lot more of my time these days, putting on shows and working with other artists is just an expanded form of my painting practice, which I always feel itself is a very holistic practice. The work is always just continuing, the content is just always spilling on right to the next thing. I never really was trying to just be a painter. I think the reason I came to the paintings was this sort of seriality, having an image and then moving to the next image. And besides the stuff that you are working with as source material, what are you watching, what are you listening to, what are you reading when you’re working? I don’t know. Probably Miley Cyrus or something.